Sneaky swarming squid sperm. Yeah, let’s talk about that. ‘Cause you hear that and you gotta know, right? But before all the sperm and the swarming is the amorous squid. Let’s start there. As you may expect, squid have both a male and a female. Male squid produce spermatophores, packets of sperm that they can transfer to the females. Female squid carry around these sperm packets until they are ready to spawn. That can be quite some time in some species. When they are ready, they will use the stored sperm to fertilize and then release hundreds or thousands of eggs into the water as jelly-like strands. That’s about what we know about squid reproduction, the rest is relatively mysterious. A newish study in Current Biology sheds some light on the mysterious nature of squid sperm. The study organism is Loligo bleekeri, one of the more common of the pencil squids (Loliginidae) in Japan and southern Korea. It is moderately large (40 cm) with very short arms. It is a polyandrous species, meaning that males only mate with one female, but females mate with many males. It is a good mating system for researchers interested in mate choice and sperm competition (oh yeah, there’s a whole subdiscipline of the science of sperm competition – rethinking your job now aren’t you?). These have been shown to drive sperm evolution (yes, that’s a thing) and morphology to optimize fertilization success. Because in this game, it’s all about how many babies you have. 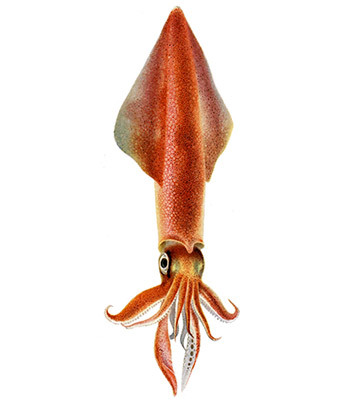 One of the things that makes this squid species particularly interesting is the dimorphism among males. Large “consort” males do all the work. They compete with other males, court females with colorful body displays, and guard the female until she spawns his offspring. Smaller “sneaker” males are just that: sneaky. They rush in under the nose (or beak, as it were) of the consort male, attach their spermatophore and book it on outta there. The dimorphism in males is reflected in their mating as well as their size. Consort males place their spermatophores inside the female’s oviduct, while the sneaker males just stick it onto the external body surface near to the seminal receptacle near the mouth. It isn’t as close to the eggs, but it must be a successful otherwise why do it? What is it that makes this stick-and-ditch strategy so successful? To find out, the researchers dissected consort and sneaker males to recover their spermatophores. Then sperm were released into test tubes, diluted and tagged with fluorescent labels (each type with a different label). They observed that when the sperm suspension was drawn into a capillary tube the sneaker, but not the consort, sperm aggregated (or “swarmed”) to form a regularly striped pattern along the tube. And, when sneaker and consort sperm were mixed, still only the sneaker sperm swarmed. The sperm weren’t slowing down or sticking together, so what was causing the swarming? It’s not like the sperm are problem solving. So the next thought was: Maybe it’s a chemical response. So a filter assay was designed where two chambers were separated by a filter so fine that only small molecules could get though. A sperm suspension was put into the lower chamber and then each type of sperm added to the top to see where it swam. Again, only sneaker sperm migrated toward the filter. Okay, so it must be some kind of chemical attractant, but what and how? Again, labeled sperm suspensions were put into capillary tubes. Then bubbles of different gases were microinjected into the solution. This assay revealed that carbon dioxide (CO2) attracted sneaker, but not consort, sperm. This CO2 is likely generated by the sperm via the carbonate system. Not exactly a super-simple system. To tease apart the mechanism, they developed caged carbonate (you’re thinking Han Solo…me too, but not quite the same) to sculpture gradients of bicarbonate (a basic solution, pH-wise). This system allowed them to determine that swarming depends on acidic (CO2 and/or H+) gradients but not on a biocarbonate gradient. Next, they found that carbonic anhydrases (CAs) are involved in swarming as CO2 sensors in cells. But let’s go back to the acid thing (as both CO2 and H+ increase acidity). The researchers used a pH-sensitive dye to look at the acid gradient during swarming. They observed that the middle of the swarm acidified first, producing a H+ gradient outwards. When they added a buffer, the swarming disappeared. When they put a pipette of acid (H+) into the suspension, both sneaker and consort sperm moved toward it. But remember that only CO2 attracted the sneaker sperm. Additionally, the pH at which these types of sperm responded was different. They found that only sneaker sperm lowered their intracellular pH with environmental pH. This means that only sneaker sperm have a H+ transport system that allows for the CO2 attraction. And finally, they showed that calcium (Ca2+) influx controls cause the sperm to turn around when they reach the end (weak part) of the gradient. Whew! That’s a lot of compact information! So let’s put it together in a whole-organism, what-the-heck-is-going-on kind of way. Why does it matter that sneaker sperm like CO2? Remember back to the placement of the spermatophores by each of the males. When the female releases her eggs, the consort male’s sperm has first access because it is in the oviduct. They fertilize a lot of eggs but not all. Then the female holds her eggs in her arms while she swims to a good substrate to release them. Squid arms and mouth are not all that far away from each other. This is when the sneaker male sperm goes to work. The swarming allows the sperm to stay close to the site of egg deposition and may be sensing CO2 released from the eggs; both increase the chances of fertilization. And, in the end, that’s what it’s all about.